In the past I have looked at quite a few spinoff games of popular board game franchises. For the most part these spinoffs fail pretty badly since they don’t fix the problems of the original game and tweak things which end up making them worse than the original game. As a child I loved the original Guess Who? As you get older though Guess Who? starts to lose its appeal as you can basically break the game if you use the right type of questions. I was intrigued by Guess Who? Mix ‘n Mash because it actually looked like it added some interesting things to the original game and tried to fix the problems with the original Guess Who? Outside of nostalgia, Guess Who? 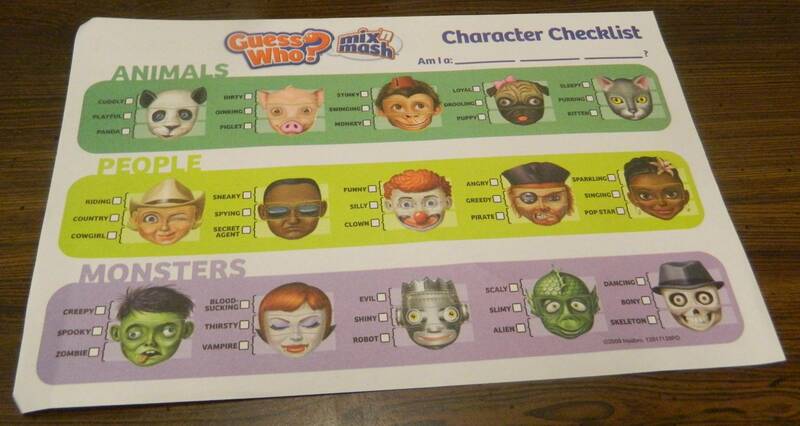 Mix ‘n Mash succeeds in improving on the original Guess Who? in almost every way. Each player takes a character checklist, a stand, and something to write with. Separate the mouth, eye, and head cards and shuffle each group individually. Each player randomly draws one card from each stack without looking at the picture side of the card. Place the three cards in the frame facing away from you to create your character’s face. At no time in the game can you look at your own character’s face. The player whose birthday is coming up next gets to start the game. 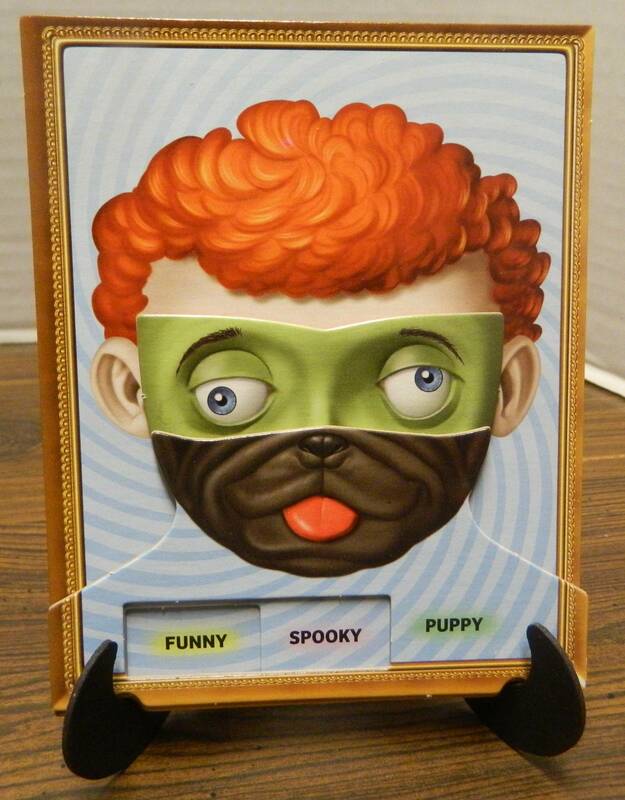 This player created a funny spooky puppy face which they will have to guess to win the game. On a player’s turn they will get to ask one yes or no question about their character to the other players. All of the other players will then answer the question. If all of the players don’t agree on the correct answer, the current player will have to ask a different question. If all of the other players agree on an answer, the current player will cross off things from their checklist that have been eliminated based on the response they received. Players will keep taking turns until someone thinks they have solved the identity of their own character. At the beginning of their turn a player can guess the three parts of their character. If a player guesses all three parts correctly, they win the game. If a player incorrectly guesses any of the three parts, they are eliminated from the game. All of the other players will keep playing until someone guesses all three parts correctly. Along with the main game, Guess Who? Mix ‘n Mash includes a variant game. In the variant game players take turns as the Director/Judge. The Director comes up with a challenge for the other players to build a face for. All of the other players look at all of the pieces and choose a mouth, eyes, and head that will create a face to match the challenge. While the other players are building their faces, the Director looks away. When everyone is finished, mix up the order of the faces so the Director doesn’t know who created each face. The Director will then choose the face that they think best matches the challenge. The player that created that face earns a point. Once everyone has been the Director once, the game ends. Whichever player earned the most points wins the game. If there is a tie, the player with the closer birthday breaks the tie. Being a spinoff game of Guess Who? it shouldn’t come as much of a surprise that Guess Who? Mix ‘n Mash shares a lot in common with its’ inspiration. The basic mechanic is still asking yes or no questions in order to narrow down the identity of your character. The main difference between the two games is that instead of just having to figure out one piece of information, you need to figure out the three characteristics of your character. Guess Who? Mix ‘n Mash basically ends up playing like a more advanced version of Guess Who? As I have already mentioned, when I was a kid I really liked Guess Who?. While Guess Who? has some problems which I will get to later, I have always liked the game even though it has obvious flaws. Guess Who? 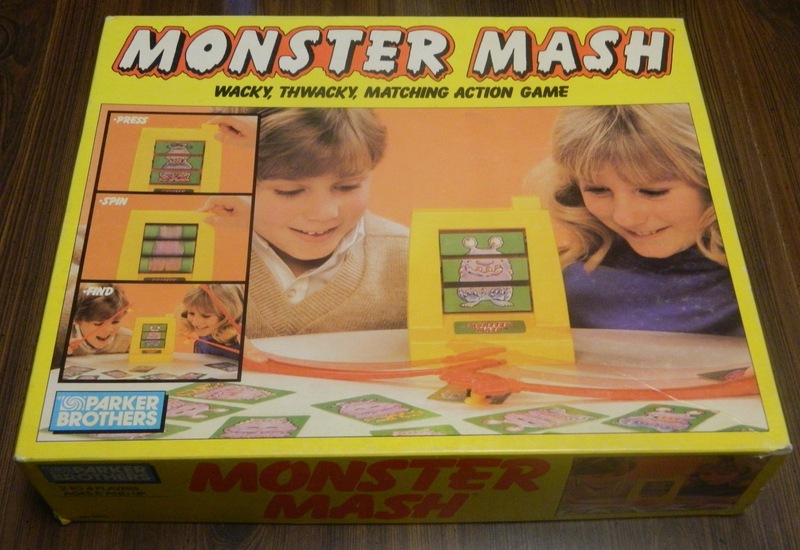 Mix ‘n Mash is just as fun as the original game and you could easily make an argument that it is more fun since it has more variety than the original game. If you like Guess Who? I can’t see you not enjoying Guess Who? Mix ‘n Mash. While I wouldn’t consider this to be a problem, you have pay more attention to detail in Guess Who? Mix ‘n Mash than you do in the original game. There is more information to wade through in the game which means you have to be quite a bit more specific when you ask questions. If you aren’t clear in what you are asking the other players could pretty easily misinterpret your question and give you misleading information. While this could lead to more issues of players giving incorrect information, it is not a big issue since you likely will have more than one player confirming every answer to a question so mistakes should be less likely. For the most part I would say that Guess Who? Mix ‘n Mash is pretty similar in difficulty to the original game. The game is pretty simple overall since you basically just ask yes or no questions. Using the answers you receive you can narrow down the possibilities for your character. I would say Mix ‘n Mash is probably slightly more difficult than normal Guess Who?. This is mostly due to there just being more information that you have to figure out in Mix ‘n Mash. Other than having to work through more information, the biggest addition to Guess Who? Mix ‘n Mash is that the game supports four players instead of two. The fact that Guess Who? only supports two players has always been a problem in my opinion. The game could have easily supported more players and yet it didn’t. While you could easily purchase two copies of the game to support more players, I don’t know why the game never included four gameboards to begin with. Guess Who? 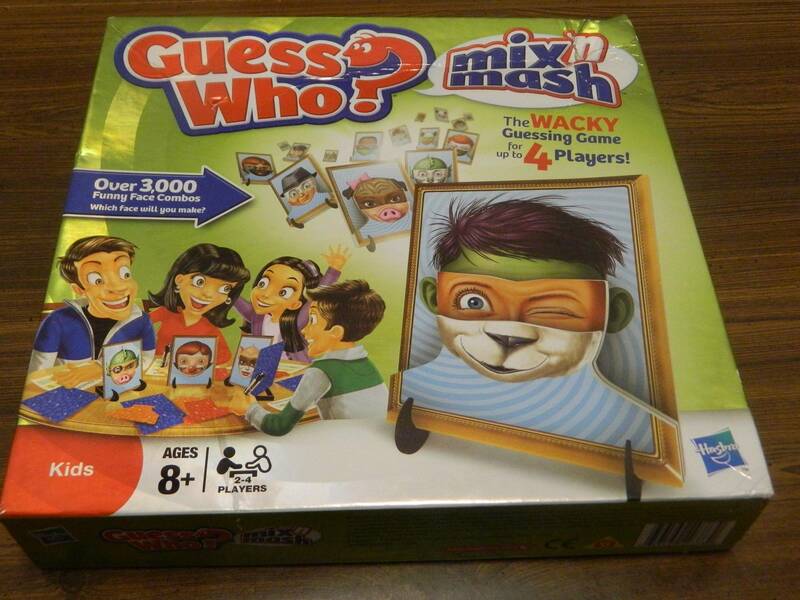 Mix ‘n Mash shows that a Guess Who? game can easily support four players and still be enjoyable. Just like with the original Guess Who? though, Guess Who? Mix ‘n Mash shares the same major problem. For those of you who haven’t checked out my How to Win Guess Who Within Six Turns post, the Guess Who? franchise starts developing a problem if you start to really think about the questions you ask. In Guess Who? the key is to ask complex questions that will eliminate close to half of the options no matter what answer is given. While some people consider using complex questions in Guess Who? cheating, I see it as strategic way to play the game and totally within the rules of the game. For the most part the same strategy works in Guess Who? Mix ‘n Mash. I will say that it doesn’t work quite as well since there are many more potential options in Mix ‘n Mash than there are in a normal game of Guess Who?. In normal Guess Who? there is a total of 24 different options. In Mix ‘n Mash there are over 3,000 different possibilities when you factor in the different combinations of head, eye and mouth cards. With so many additional options it is not surprising that it takes quite a bit longer to guess someone’s identity in Guess Who? Mix ‘n Mash than in normal Guess Who?. The best strategy to implement in the game is still basically the same as normal Guess Who? though. To maximize your questions you likely want to eliminate a third to half of the remaining body parts with each question. The best strategy seems to be to narrow down if your creature has animal, people or monster parts and which parts belong to each category. If your creature doesn’t have any parts for one of the categories you can cross off every part from that category. You then ask questions that further narrow the options for each category. While it will take longer than normal Guess Who? if you are methodical you can still solve your identity pretty quickly. While this is a problem for serious/methodical players, it isn’t going to be a big issue for most players. If you don’t care about maximizing every question you won’t run into this issue at all. Guess Who? has always been a game that works better when you don’t put too much thought into your moves. Going in with a strategy will make you more successful in the game but it also takes some of the fun out of the game. While I think Guess Who? 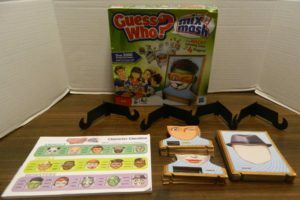 Mix ‘n Mash is a solid game for adults, I think children will love the game since they won’t over analyze every question. I also think children will really like creating the different creatures since some of the creatures can be quite strange/funny. While I didn’t personally try the Wacky Faces alternative game, I give the game credit for trying to come up with another game that uses the components included with the game. Basically the mode kind of feels like an Apples to Apples style game except that the judge gets to come up with their own prompt. The main reason I didn’t try the mode is that it seems a little too silly for adults. I can see the mode working quite well with children but I think there are much better Apples to Apples style games for adults. Basically I would say the Guess Who? Mix ‘n Mash is better than normal Guess Who? in every way other than nostalgia. Guess Who? created some fond memories since I played the game a lot when I was a kid. I don’t see Guess Who? Mix ‘n Mash ever creating that nostalgic feel but it is otherwise a better game. That is mostly because it provides more challenge due to the amount of variety that is included in the game. Rarely will two games ever be the same. With more potential options your line of questioning is also not as straightforward which forces you to get more creative when asking questions. Outside of looking for a trip down memory lane, I would recommend playing Guess Who? Mix ‘n Mash before the original Guess Who? While I didn’t have strong expectations for Guess Who? Mix ‘n Mash, it found a way to do something I never expected. Guess Who? Mix ‘n Mash actually improved on its’ predecessor which is a pretty rare occurrence in the board game industry. Guess Who? Mix ‘n Mash still suffers from players being able to “solve” the game through creatively worded questions. Other than being nostalgic for the original game though, Guess Who? Mix ‘n Mash is better in every way. The game forces you to figure out more information which adds depth to the game. Guess Who? Mix ‘n Mash takes normal Guess Who? and adds quite a bit more variety to the game. If you have never really cared for Guess Who?, Guess Who? Mix ‘n Mash is probably not going to be for you. If you like Guess Who? though, I think you will also enjoy Guess Who? Mix ‘n Mash because it is basically superior in every way. Improves on the original Guess Who? Offers quite a bit of variety. You can kind of "solve" the game through the right line of questioning. Might feel a little too silly for adults.